How will they, therefore, endure the presence of the Lord and His eyes "a fiery flame," they who sin against Him, they who rise up against Him, they who ridicule His Name, they who despise His love and sacrifice, they who mock His cross, they who trample upon His commandments, they who persecute His Church, they who shame His priests, and they who kill His faithful? 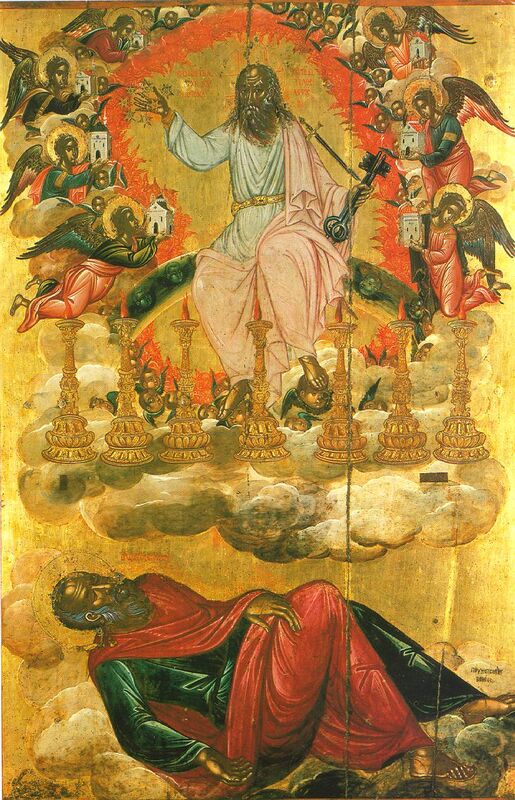 What will happen to them before the face of the Lord when St. John fell as dead when he caught sight of Him? What will happen to the literate who corrupt? What will happen to teachers who destroy the Faith in young souls? What will happen to skeptics who through their doubt poison the minds of men? What will happen to thieves and robbers and what will happen to the immoral and what will happen to the child-killers? What will happen to the enemies of Christ when the friend of Jesus falls, as though dead, before His indescribable, glistening glory? Such is the glory, power, authority, beauty, lordship, light and majesty of the Lord Jesus, resurrected and ascended, that His closest companions who for three years on earth gazed upon His face without fear, now fall as though dead when they see His face in the heavens following His passion, death and victory! O Lord All-glorious and Almighty illuminate us and enliven us by Your power and glory. To You be glory and thanks always. Amen.